Plants: they absorb energy from the sun and store it in the carbs they make from carbon dioxide and water, for future growth of the plant. Animals also create and store a form of carbohydrate known as glycogen from dietary sugars, fats, or proteins, for short term use mainly by muscles. These same carbohydrates form a food class for humans, that include simple sugars and chains of simple sugars. Most dietitians divide carbs into three major classes: Sugars, Starches and Fiber. Read on for more detail. Fiber (non-digestible longer chains of sugars) provides 0 calories/gram (its sugars are mostly fermented to fatty acids by gut bacteria, or pass from the colon with the stool). However, resistant starch (a newly recognized type of fiber) provides approximately 2 calories/gram (only about half of the component sugars are digested, to provide calories; the remainder are converted to fatty acids). But the field of carbohydrates is really more complex than that. in a ring with a ketone (an oxygen single-bonded to two carbons) group attached to one of the carbons, and an alcohol group attached to the remaining carbons. The remaining carbons have an alcohol group (OH) and 1 or 2 hydrogens (H) attached. 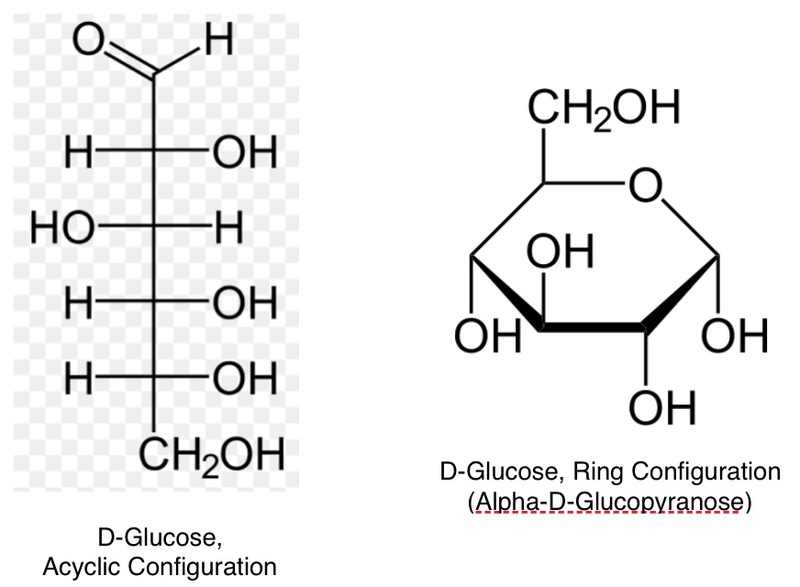 Both the acyclic and ring configurations of glucose are illustrated, below (image is a combination of images from Wikipedia (1)). Most simple sugars are readily absorbed from the gut. The most common of the simple sugars in human metabolism are: glucose, fructose, mannose, galactose, fucose, and xylose. These are the simplest chains, made up of two simple sugars linked together. For example, sucrose (table sugar), which is one molecule of glucose bound to one molecule of fructose. Other examples are: lactose (galactose bound to glucose) and maltose (glucose bound to glucose). Most disaccharides are digestible in the human gut, but some, such as lactose, are not digestible for many people who lack the proper enzyme (e.g., lactase to digest lactose) to break the sugar-to-sugar bond. Sucrase breaks down sucrose into its components of glucose and fructose. The long, linear chains are called cellulose; they provides structure for the plants. The long, complex branched chains are called starch, and are the way plants store energy (from the sun) for future growth. Cat’s note: starch and sugar are really the same thing because starches are quickly broken down into glucose components in the early stages of digestion. Glycogen is the “starch” of the animal kingdom, long and complex branched chains of glucose, used for short-term storage of energy. It is not as compact an energy reserve as the triglycerides stored mainly in fat cells, but it delivers energy more quickly than triglycerides (fat). Fiber is a chain of monosaccharides that include those other than glucose in the mix. Our bodies only have enzymes that break glucose-to-glucose, glucose-to-fructose, and glucose to galactose bonds. Bonds involving other sugars cannot be broken down by our bodies (because we don’t have the enzymes), though some can be broken down and converted to healthful fatty acids by bacteria in our gut (rather than to the component sugars). Others are flushed out with our stool. Insoluble fiber, such as those in whole grains; this type passes out with our stool, but not before cleaning our intestines like a brush. More recently a third type of fiber has been discovered, that has properties of both soluble and insoluble fiber, called “Resistant starch” (RS). It is not easily digested (resists digestion) and instead serves as food for gut flora that produce short-chain fatty acids that heal and protect the colon. It has half the calories of regular starch. One of the most important short chain fatty acids produced by the bacteria that digest RS is butyrate (see Butyrate for more about this fatty acid). Cellulose: these are long linear chains of glucose, but can not be broken down by our bodies, so it falls into the larger class of fiber. Fructan is another fairly common form of fiber, primarily found in the roots of the Compositae family (daisy, dandelion, burdock, echinacea, sunflower, chokes, etc. ), but also in vegetables such as asparagus, green beans, garlic, onions, leeks, and wheat. Generally, foods that store energy as fructans (fiber), do not store energy as glucans (starch). The most well-known fructans are the inulins, which include shorter-chain fructo-oligo-saccharides (FOS); and longer-chain inulin. (Two other categories also exist: levans and graminans). Inulins would pass through our digestive tract and out in our stool intact, were it not for the good bacteria (probiotics) in our large intestine, who, rather than breaking them down into simple sugars, ferment them into non-sugar products we can absorb, as well as a bit of gas (carbon dioxide, hydrogen, and/or methane). If you are not used to eating inulin-rich foods, go easy at first. Gums are another form of indigestible carbohydrate, or fiber. For example, pectin, agar, guar gum, xanthan gum, gum arabic, and sodium caboxymethyl cellulose. 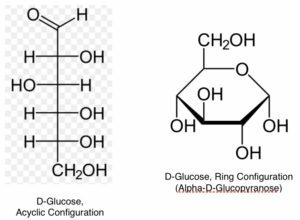 These carbs are chains of different simple sugars such as galactose, mannose, and glucose, and may be linear or branched. Humans lack the enzymes to digest them, and most are also untouched by probiotics, so these carbs are excreted in the stool. This entry was posted in Health and tagged carbs, fiber, starch, sugar. Bookmark the permalink.